Buying a kayak can be an overwhelming decision for any level of paddler, but when you’re first starting out it can be even more confusing. There are so many different types of vessels, with various features and extras that you may not always be sure what exactly you will need for yourself. What are the different types of vessel used for? What type of kayak will be the easiest to learn in? What are the best kayaks for beginners? And you may have other questions on your mind, such as, where is best to learn the sport? To give you a helping hand and answer these questions, we’ve put together some information that you might find useful when you head out there to make that first purchase and take your next step to becoming a paddler. What Kayak Is Good For Beginners? Probably the most important feature to look for on a kayak if you’re just starting out, is its stability. You will not want to be capsizing on your first outing on the water, so making sure that the vessel is designed to be as stable as possible is always a good point to consider. The more stable vessels will be wider and quite often, shorter than more professional styles. The wider the yak, the easier it will be to keep it upright, but this also will depend on the shape of the hull. There are two main types of stability to consider when choosing your craft. The primary stability, which is how stable the craft is on calm, flat water, and secondary stability, which is how stable it is when the conditions are rough and it could potentially tip over. The flatter the hull, the more stable the yak will be on flat water, which could be a good choice if you’re just starting out. When you’re starting out in a new sport or activity you will want something that is going to be able to withstand the learning curve and the various knocks it may get as you get to know the sport. So, it’s best to choose a yak that is durable and sturdy. Plastic vessels will offer more durability than some other materials and will also usually cost less. Inflatable vessels can also be very durable, as well as cost effective, and can be a good choice for beginners. If you’re purchasing a yak for fishing you may need to consider other features in addition to stability and durability. You will need to decide where you plan on fishing before you can choose a suitable craft. Fishing yaks designed for the sea may not meet your needs on a flat water lake and vice versa. This is because they will have different hull designs in order to accommodate the different conditions. If you plan to fish on the sea or saltwater lakes, you will also need to make sure that the vessel you choose is able to withstand corrosion and the harsh conditions. Making sure your paddle is corrosion resistant is equally as important. Some fishing yaks will be longer to allow for more speed through the water, which may make it easier to paddle over longer distances to get to the best fishing areas. They will also usually have more storage space for all your fishing gear. Inflatable vessels are an ideal choice for beginners because they’re durable, relatively inexpensive and easy to transport. They are great for beginners as they are pretty versatile, so you can use them in different environments and not need a separate vessel for the sea and another one for flat water. When you’re just starting out, you may not have all the transportation equipment or perhaps you don’t want to shell out for the extras right away, which is why an inflatable yak can be ideal. It can be deflated to fit in the trunk of your car or sometimes fit into a backpack, so you can take them anywhere. Because they’re lightweight first time kayakers may find them easier to maneuver. They are also quite easy to maintain, with them usually just requiring to be fully dry before they’re packed away and if they puncture you can easily patch it up with a puncture kit. Hard shell kayaks can come in a range of materials, each designed for a particular use. The best hard shell material for beginners is plastic because of its strength and durability. It is also the least expensive of the hard shells. Materials such as fiberglass and carbon blends can be very expensive but these types of yaks are favored by serious kayakers because of their ultra light weight. Racing vessels will often be made of these lightweight materials. Although the fiberglass and carbon blend vessels are durable, they are more susceptible to damage during transportation and can be expensive to repair. It’s unlikely, as a beginner, that you would be needing the high performance qualities of a composite vessel. A sit-in kayak is the most traditional type of yak. It features an enclosed cockpit where you would sit with your lower body entirely within the body of the vessel. This will allow your lower body to stay dry and, in cold climates, warmer. The idea of being confined inside a vessel may not appeal to all new paddlers, so this may not be the best type of yak to learn in. However, they are stable but they will require you to know different techniques in order to exit the vessel in the event of a capsize. As well as for recreational use, sit-insides are also used in more extreme sports, such as whitewater kayaking. A spray skirt can be attached to the rim of the cockpit to prevent any water from entering the craft so that you can continue to paddle without needing to bail the water out. Sit-insides can be more difficult to enter in the event of a capsize because you will usually find that water has entered the cockpit. You will often then need to bail it out manually while on the water or more frequently, head to shore to bail it easier. Sit-on-tops are popular with beginners because of their ease of use. Unlike with the sit-in, the seat is positioned on top of the deck, so your lower body movement is less restricted. This also means that you’re able to get in and out a little easier, which makes them ideal for recreation. If the weather’s warm you can usually jump out for a swim and then jump back on when you’re done. Because of the design of a sit-on-top, you are likely to get wet when you’re paddling. There is no weather protection or splash protection when you’re on a sit-on-top, so they are more frequently used in areas with warm climates, unless you’re wearing waterproofs. Sit-on-tops don’t need to be bailed out manually, like the sit-in because they usually have scupper holes in the deck that allow the water to drain through. Because of these holes, you will find that water will splash up from below but you can often use scupper plugs to prevent this. Recreational kayaks are designed for just that: recreation. They are usually stable, easy to use and a good choice for beginners. They’re often wider than more professional vessels, to give them better stability. However, this also means that they won’t be quite as hydrodynamic, but when you’re just learning, speed is not going to be your main priority. They will allow you to learn the paddle strokes and techniques, even if they may not be the most efficient water vessels. These types of yaks tend to be more affordable but they can also be heavier when it comes to transporting them to and from the water. Recreational yaks come in a range of lengths and are available in extra short lengths for children. This means they’re easier for kids to maneuver by themselves on the water and they also tend to be a little lighter in weight than the adult sized ones. Many of them are also made for children to be able to carry them themselves. Just like a tandem bicycle, a tandem yak has two seats, so that two of you can paddle together and share the experience. These vessels can be just as good for beginners as a single vessel, because they come in a variety of styles. You can get wide, stable recreational yaks that are made for two paddlers and you can also get inflatable tandems. With a tandem craft you may find that there is more storage space for your gear and sometimes you will even get extra space for a third person, usually a child (or a dog). This can often mean the vessels are larger and heavier, which could make transporting them more of a challenge. However, if there are two of you, you may find it’s easier to transport a tandem than it is to transport a single yak when you’re on your own. With a tandem, each of you can share the paddling, so moving across the water is a joint effort. You just need to make sure you’re both on the same page and paddling at the same pace. Fishing kayaks are designed with anglers in mind, so they are geared up to be able to handle the extra cargo. They also tend to have more comfortable seating, which can often be tailored to you personally, with the ability to choose your own specific seat. They come either rigged or not. If they’re rigged, they come with the seat already installed. If not, you would be required to choose your seat and install it separately. This can be good if you know you’re going to be spending a lot of time in the yak and will want a comfortable seat. Yaks designed for fishing will also tend to be heavier than recreational kayaks and they’re often wider and larger to accommodate for the extra storage and space on deck. This can mean they’re more awkward to transport, especially if you’re on your own. There are plenty of kayaking schools, where you can learn and develop skills right up to more technical levels. But if you’re looking to get out on the water in a yak for the first time, the best places to learn are on calm, flat water. Calm lakes and slow moving rivers are ideal for learning the initial paddling skills that you’ll need to get started in the sport. Learning in the sea can be particularly tricky because of the underwater currents and the waves, which could be a hazard. Some schools have swimming pools where they teach basic techniques in a safe environment, which may be more appealing to some people than a wild environment. You will often also find there are classes just for kids too, which can be less daunting for them when they’re with their peers in a pool. This can be an ideal kayak if you’re looking to head out on the water with a partner. It’s a sit-on-top vessel that is lightweight, weighing just 57 pounds, which makes it easy to carry when there are two of you; there are even carry handles at the bow and stern. The craft has two comfortable seats for each paddler and there is even a molded seat in the middle for a child or a dog. The center seat can also be used to paddle the yak on your own. This is a 12 foot long recreational tandem yak that is 34 inches wide, giving it that extra stability and can be a good choice for beginners on calmer waters. Its plastic hull means it is durable and able to stand up to some of the abuse that beginners might subject it to. This is a compact little 10 foot tandem that is lightweight, at 60 pounds and can be a good choice for casual paddling. It’s a recreational yak with a hull that is designed to prevent capsizes and allow you to paddle in a straight line more easily. It’s a plastic sit-on-top that’s durable, easy to maneuver, very stable and 36 inches wide. It has two seats with backrests to give a more comfortable ride for the paddlers, but there’s also space for a third person in the center seat. The seats are positioned slightly higher on the deck to give you a drier ride and better visibility. It also features cup holders and bungee cord storage so you can take your gear along. It would make a good vessel for taking on picnics or exploring the shores along intracoastal waterways or lake islands. This sit-in yak is a compact fishing craft that has a large open cockpit, so you still have some room for movement. Being just 10 feet long, it’s easy to transport and will fit in the back of most pickup trucks. It’s also lightweight, weighing 40 pounds, so it will be easier to lift and carry when you’re on your own. The Excursion yak is 30 inches wide, so it has good stability, especially given its short length. Its shorter length means it should be easy to turn and maneuver, which you’ll discover is important when you’re fishing. However, because of its short and wide design, paddling at speed might be a particular challenge, as it is designed with stability and maneuverability in mind, as opposed to speed. Because it’s designed for fishing, there are lots of storage areas, including 3 rod holders and a storage hatch. The seat can also be adjusted to suit and it has a high back for extra comfort. This recreational sit-inside yak could be a wise choice if you’re looking to head out in choppier waters, as it has a hull that is designed to give you good secondary stability, so it will be able to withstand waves better than a flat hull. This Pungo 120l is a 12 foot vessel that weighs 49 pounds and is 29 inches wide. It could be a good choice for fishing or if you’re going on a trip, as there is a lot of storage and because of its length and width it will be more hydrodynamic than a shorter, wider craft. There’s a convenient dry seal hatch in front of the seat, with a cup holder and flat surface, as well as a second hatch behind the seat and bungee cords on the deck for extra gear. It also features a fully adjustable seat, designed to give you more comfort if you’re out on the water all day. If you’re looking for a fishing yak to get started on then this could be a good option. It’s a sit-on-top vessel that will allow for freedom of movement and easy exiting. It’s 12 foot long, with carry handles at the bow and stern but is slightly heavier than some yaks, weighing 64 pounds. This Pescador Pro fishing craft is made with durable plastic and has plenty of storage for all your gear, with a spacious storage area behind the seat and a mesh covered area at the bow. It is a stable vessel, measuring 32.5 inches wide, with molded-in rod holders and a stadium style, adjustable seat that can even be reclined to make you even more comfortable when you’re out on the water. The seat can also be removed. The plastic hull means it will be suitable for both fresh water and saltwater, as long as you remember to rinse it off in fresh water after you’ve been in saltwater. Now that you’ve read about what type of kayak might be the best for a new paddler to learn in, you should now know what you’re looking for when you head out to buy yours. Choosing your new vessel doesn’t have to be difficult when you know what type you’d prefer. 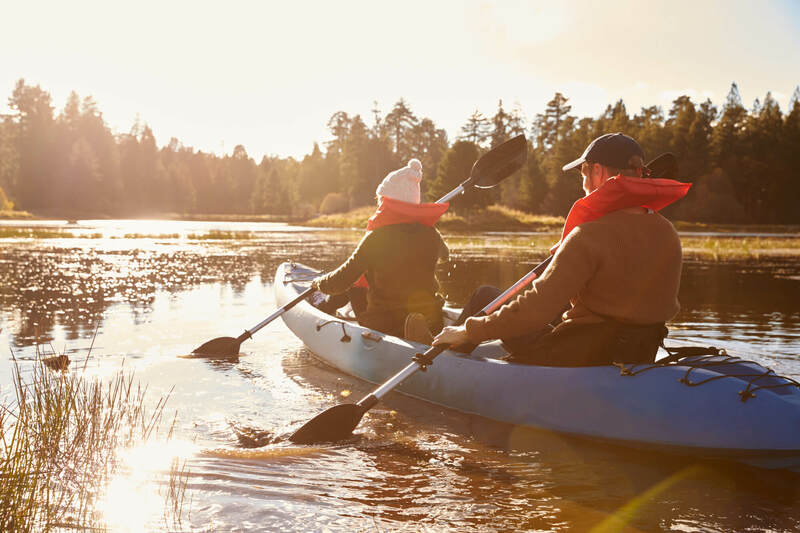 Renting kayaks can be a good place to try out some of the different types before you make the splash into buying one of your own. Retailers will also have demo days where you can try out the craft. Keep in mind that you don’t need to buy the most expensive vessel when you’re just starting out, nor do you need to have tons of features that you might not need. Look for a stable, durable craft that will be easy for you to transport back and forth to the water - and one that fits your budget - and you’ll be out enjoying the water in no time!